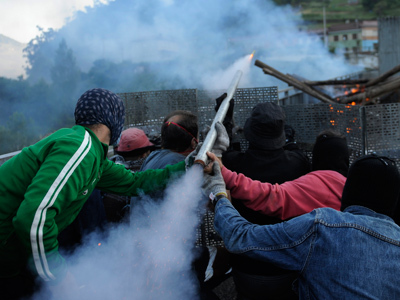 Clashes have flared after Italian police dispersed a crowd of protesting Italian workers. Around 600 demonstrators gathered in Rome to pressure the government to re-open a recently closed aluminium plant in Sardinia. 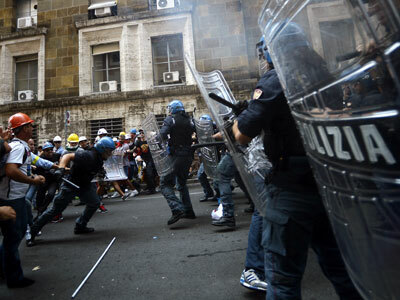 ­Police used extensive force to push back the workers, who were trying to enter the Ministry of Economic Development in Rome, where government officials were meeting with labor unions and executives from the firm Alcoa Inc.- who own the plant. 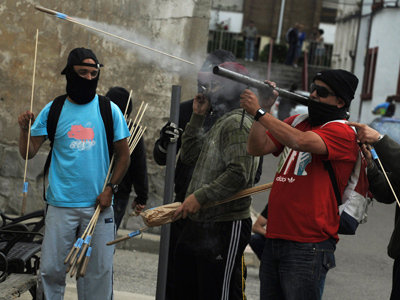 Talks centred around trying to save jobs, but meanwhile an angry mob set off large firecrackers and threw missiles at police lines to make their message heard. Profit-losing US-based Alcoa, plans to shut down the factory by November unless a buyer is found. 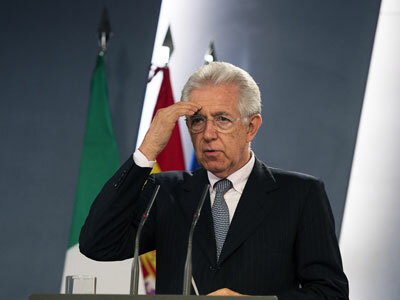 The only interested candidate, German hedge fund Aurelius, pulled out of negotiations with the Italian government in August. Swiss industrial group Klesch showed interest in the plant, but Alcoa in an email later said it had "not received any expressions of interest that are viable or different to those previously considered." The Italian government is under extreme pressure from the labor unions to save the smelter, which supports about 1,500 jobs in Sardinia. Its closure would be a heavy blow for an island where unemployment is around 15 percent. The secretary of Italy's Cisl trade union, Raffaele Bonanni, who took part in the Rome march, said cost-effective clean energy was the way forward for the region. "This difficult situation must be resolved because it is unacceptable to lay waste to such a poor area of Italy," Bonanni said. "The country's industrial policies have been abandoned for 20 years. Alcoa is like many other examples throughout the country." Following Monday’s meeting with trade unions and Alcoa representatives, Italy's industries ministry has said that the plant has agreed to slow down the closure while the ministry would make the last effort to summon companies that have expressed interest in the plant for talks. Alcoa workers are not the only ones protesting in the face of possible unemployment. 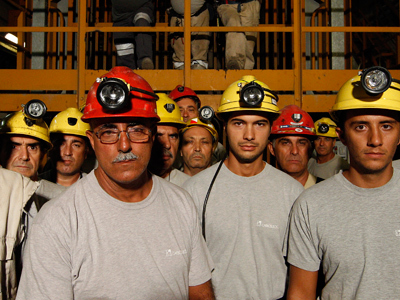 Last month, some 100 Sardinian miners, armed with hundreds of pounds of explosives had barricaded themselves over 400 meters underground in Italy’s only coalmine, threatening to blow themselves up unless the government vows to protect their jobs. The incident ended with one miner slashing his wrist during a live TV address.